One of the street foods and drinks that I miss the most about Venezuela has to be the “chicha”. A Venezuelan chicha is a super thick drink made with rice and milk. It is dense and if you add a lot of ice you get a refreshing and fulfilling drink that tastes like heaven. Chicha is a classic South American drink that you can find in a lot of countries and all of them have a different interpretation. In Perú, they have “chicha morada” made of corn and it has a strong purple color. The colombian chicha is also made of corn but isn’t purple. And of course, Venezuelan chicha that is made of rice and I will show you how to do it! My sweet tooth always miss this scrumptious drink. A good glass of chicha was my reward after a long day of school. My mom used to take me to the “chichero” (the chicha guy) after class and this way I could wait for dinner without snacking like the hyperactive kid that I was. This traditional drink is heavy. I mean, after one glass you will end up with a full stomach. It’s blended rice with thick and condensed milk. This is a bomb! But it is so delicious and you can truly feel the Venezuelan gastronomy with one sip. Venezuelans are like this drink: kind and comforting. There is no way you feel unhappy after drinking rice chicha with some friends after a long day. The key for the perfect venezuelan chicha is to soak the rice for at least 2 hours. I recommend doing it overnight. After the soaking process you have to rinse the rice and then cook it with fresh water to soften the rice until it’s soggy. After that,the process is basically blending the soften rice with the rest of the ingredients. To sweeten, I like to use only the condensed milk. But you can taste the chicha and if you would like it to be more sweet you can add a few tablespoon of sugar. Finally, add a lot of ice and enjoy a typical Venezuelan homemade chicha! One of the street foods and drinks that I miss the most about Venezuela has to be the “chicha”. A Venezuelan chicha is a super thick drink made with rice and milk. Soak the rice in 2 cups of water from 2 to 12 hours. Rinse the rice and cook it in a pot with the 4 cups of water remaining. Cook it for 40 minutes until the rice is extremely soggy and can’t absorb more water. Let it chill. 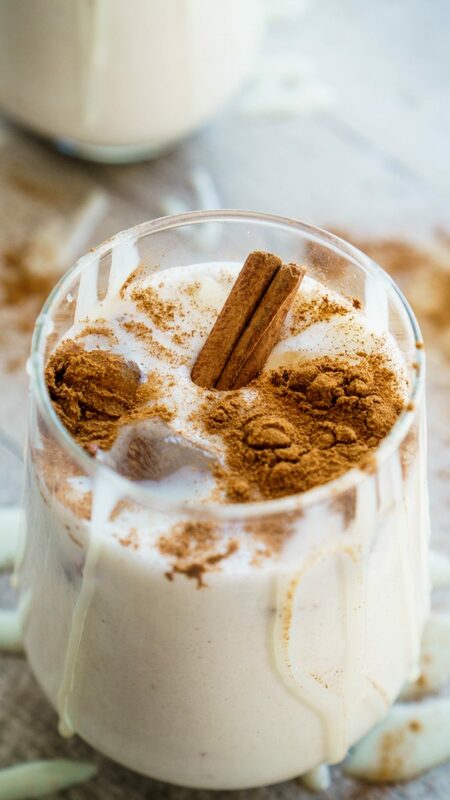 Take to the blender and blend the rice, the milk, the condensed milk, the salt, the cinnamon and the nutmeg. Blend in high speed for 5 minutes. You can add more milk if your feel that the chicha is too thick. This does look really good. I am not Venezuelan, but good food is good food! Yum. Is it condensed milk sweetened or not?